NASA engineers are putting the finishing touches on plans for a spacewalk Nov. 1 to isolate a small leak in the ammonia cooling system used to carry away heat generated by the electrical gear that stores and distributes power from one of the International Space Station's eight huge solar panels. The leak is tiny, the equivalent to a hole about the diameter of a human hair. But if it is not bypassed or repaired, the coolant in the channel 2B solar array will drop below safety margins over the next few months, taking down a critical power channel. In a bid to locate the leak, Expedition 33 commander Sunita Williams and Japanese astronaut Akihiko Hoshide will suit up and venture outside the station to operate a valve and reconfigure coolant lines, isolating the part of the channel 2B coolant loop that snakes through a large folding radiator. Then they will deploy a spare radiator used during the early stages of space station assembly and route the channel 2B coolant through the older panel. If the leak ultimately goes away -- and it likely will take several weeks to find out -- engineers will know the problem was in the original radiator, most likely the result of a space debris impact. If the leak continues, however, they would have to consider replacing a pump module or taking more extensive steps in a future spacewalk. But they will have more time to consider their options. The old radiator has ammonia of its own to contribute and using it will effectively top off the system, keeping the coolant equipment operating for another year or so, assuming no other problems, while engineers consider their options. Mike Lammers, the flight director for the spacewalk, said engineers believe the leak is either in the photo-voltaic radiator -- PVR -- or in the pump flow control system, or PFCS, that pushes ammonia through the coolant loop. "We're real suspicious of the radiator, just because it kind of stretches out there and its susceptible to micrometeoroid impacts," he said. "The goal of this EVA is to isolate the PVR from the system by closing (a) disconnect. By doing that and watching the quantity that's in the radiator that's cut off from the rest of the system, we can kind of determine if that leak is in the PVR or the PFCS side." 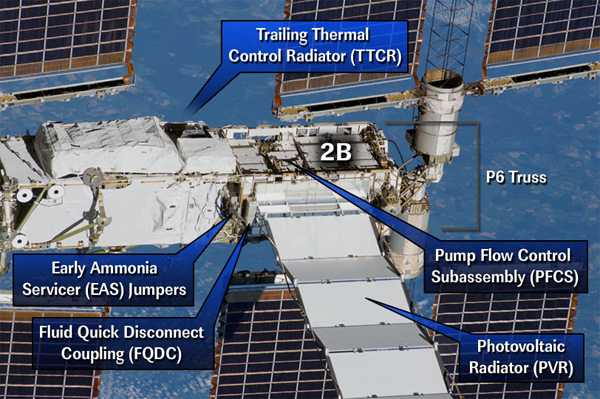 The lion's share of the International Space Station's electrical power comes from four sets of dual-panel solar arrays, two on the right side of a 357-foot-long truss and two on the left side. Each set of solar arrays features two 115-foot-long panels that extended in opposite directions. The Russian segment of the station taps into the U.S. power grid to supplement electricity generated by two relatively small solar panels on the Zvezda command module. The two U.S. arrays at the far left end of the station's integrated power truss -- the port 6, or P6 arrays -- feed power to electrical channels 2B and 4B. The P6 set of arrays, like its three counterparts, routes power from the solar panels directly into the station's electrical grid during daylight passes, at the same time charging dual sets of batteries that take over during orbital darkness. Each power channel generates between 150 and 160 volts of direct current, but downstream equipment near the center of the power truss -- equipment that uses a separate cooling system -- steps that down to 125 volts DC for use by the station's internal systems. To keep the power generation components cool, each of the four sets of arrays uses two independent coolant loops that circulate ammonia through cold plates to carry heat out to a single shared radiator that extends from each module. The photo-voltaic radiator weighs 1,650 pounds and is made up of seven panels measuring 6 feet by 11 feet. A slight 1.5-pound-per-year leak in the channel 2B cooling system has been present since 2007 and during a shuttle visit last year, two spacewalking astronauts added eight pounds of ammonia to the reservoir to boost it back up to a full 55 pounds. The plan at that time was to top off the system every four years or so to "feed the leak," replacing the lost ammonia as required. But over the past few months, engineers saw the leak rate suddenly quadruple, either because something changed at the original leak site or, more likely, because another leak developed somewhere else in the system. Whether the leakage was caused by space debris or a component failure of some sort is not yet known. But the result is: If the leak continues at its current rate, the coolant will drop below a 40-pound safety limit and the system will shut down by the end of the year or shortly thereafter, taking power channel 2B down with it. While the space station can operate without the full complement of power channels, the loss of channel 2B would force flight controllers to power down equipment, eliminating redundancy and reducing the amount of research the crews could carry out. 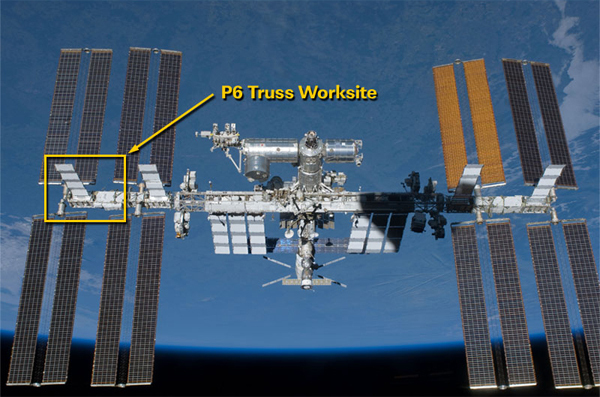 In a lucky break for NASA, the P6 truss segment was the first installed on the station and it came equipped with a separate cooling system used early in the station's construction. That early external thermal control system, or EETCS, was shut down, and its two radiators retracted, when the P6 segment was moved to the port side of the integrated power truss and tied into the station's main power system. To isolate the P6 coolant system leak, Williams and Hoshide will divert ammonia coolant into the old system by operating a valve and reconfiguring jumpers at a panel of quick-disconnect fittings. One of the old radiators then will be re-extended to provide cooling to the channel 2B components. That will buy time for engineers to track down the leak and figure out what might be done about it. If the leak is in the P6 radiator, managers could decide to simply let it leak out and use the old coolant system indefinitely. If necessary, a spare radiator could be installed during a future spacewalk. Likewise, if the leak is in the channel 2B pump module, a replacement unit could be installed later. But the simplest solution is to isolate the PVR in the upcoming spacewalk. "What this (spacewalk) will tell us is whether the radiator is the cause of the leak," said space station Program Manager Mike Suffredini. "If it turns out the leak continues, we have a little time. When we filled this system a year ago, the result of that fill was to also fill the early ammonia system as well, so we have extra ammonia in that loop. "So it buys us a little time. It lets us isolate the PVR to see if that's the cause. if that turns out not to be the cause, then we have to think about the next steps."